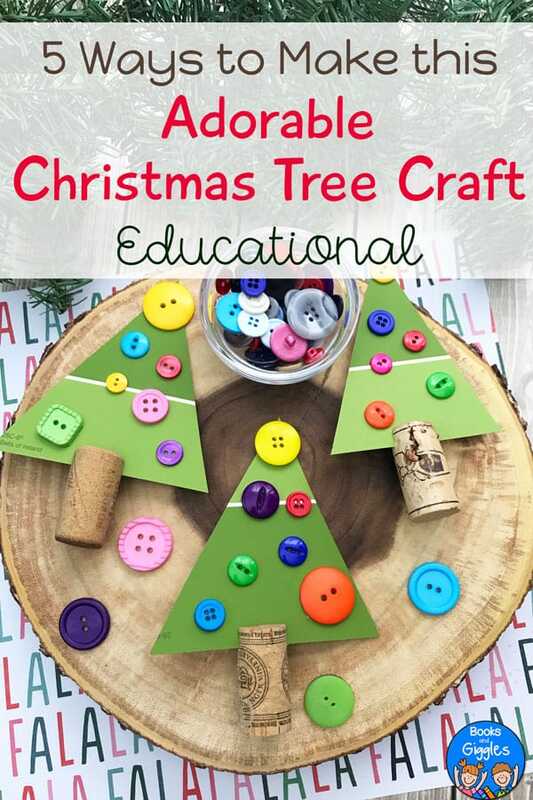 Today I’m sharing another fun Christmas tree craft with you. 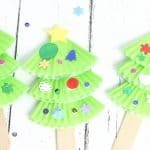 Just like the cupcake liner Christmas tree craft for kids that I shared recently, this craft is simple enough for preschoolers, but older kids can enjoy it too by adding more detailed decorations. Look at the paint chips and talk about how colors come in different shades. 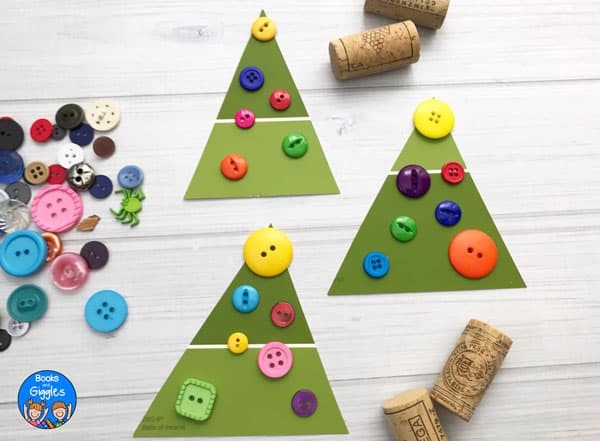 Talk about triangles – the tree shape is one kind of triangle (isosceles) and the pieces you trimmed off to get it (depending on the shape of the card) could be a different kind (right triangle), but they are all triangles. 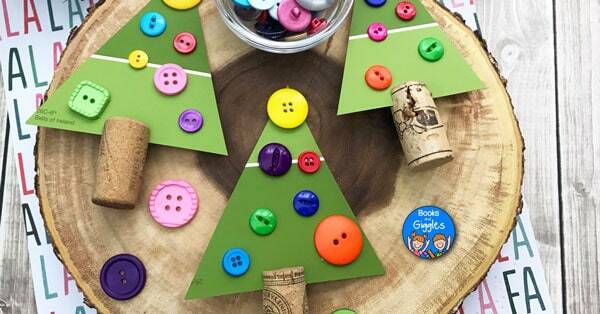 Sort the buttons by color before selecting and gluing them onto the tree. Pair this with a book about Christmas trees. I think Pick a Pine Tree by Patricia Toht would work well (affiliate). Of course, the fine motor aspect of the craft itself is also educational. 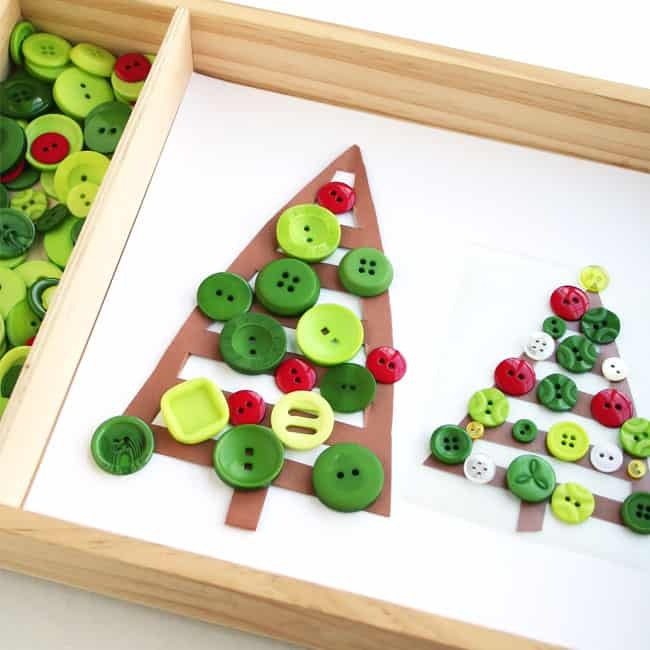 Picking up and gluing buttons can help strengthen those little fingers and improve eye-hand coordination. 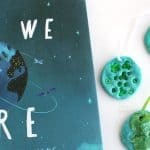 What a fun way to get kids ready to write! 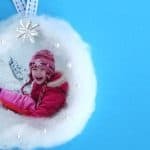 If you prefer, you can make these trees without the trunks, or glue on a small rectangle cut from a brown paint chip instead. But I think the corks are the cutest! The wine corks needed here are a great excuse to have a few friends over this holiday season. But if you need more corks you can order them in bulk from Amazon (see below). 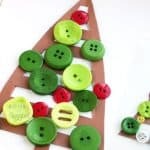 By the way – if you end up with leftover buttons, you can use them in this fun story-inspired Christmas invitation to play activity. For younger children, pre-cut the paint chips into triangles. For slightly older kids, you may want to draw cutting lines on the paint chips to help the kids to cut out their own trees. Use the paring knife to gently saw a small slit into the top of the wine cork. Cut the green paint chips into triangles. 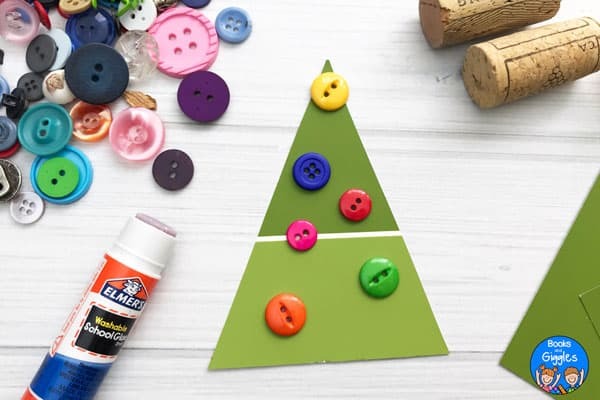 Use the glue stick to affix the buttons onto the tree. Glue a yellow ‘star’ button on top of the tree. Slide the tree into place on the “trunk”, as shown above. 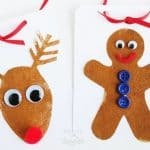 You could display a class set of these little Christmas tree crafts by standing them up in a bit of play dough, or hot gluing them to a sturdy surface. They also make a nice send-home craft.